Large efficiency with king size bed and full size bath. New kitchen plus outside grill. Step outside to a beautiful sandy beach. We are lcoated midway on the island so makes it great for day trips to the north or south. We have kayaks, a canoe and rowboat that doubles as a sailboat for your use. Quiet location with easy access within a 5-7 mile radius to grocery stores, restaurants, a bakery and fresh produce. The property faces south so you can enjoy beautiful sunrises and gorgeous sunsets! We provide all the linens you will need...fresh ones are available whenever you want them. No washer available to guests...most guests hand wash and hang on the clothesline outside. We provide all the towels you need including beach towels. Fresh towels provided as you need them. We provide paper towels, salt and pepper, dish detergent, sponge, dish towels and your first gallon of water. FREE bottle of rum to start your vacation! Table with 2 chairs, booster seat available for toddler. Extra chairs are available if you need them. We have 4 single kayaks, a clear double kayak, a canoe and a row boat that doubles as a sailboat for your use. We have beach chairs, noodles, floats, some masks and snorkels, kids beach toys, umbrellas for the beach and more. We enjoyed our time at Skip and Sharon’s so much ~ we had our coffee overlooking the beautiful waters! They have an attention to detail which made our stay even better than we could have imagined. Our suite was immaculate and so comfortable. They even had a cooler for us to use when we ventured out to enjoy the island! Skip even took us up to the local pizza joint for pick up! You two are delightful and we’re thankful we had time to spend with you! Thank you again for choosing us for your vacation. Of course with fun friendly people like the both of you, it makes our job so much easier. We enjoyed having you as guests and we hope to see you again...with or without family or friends. Thank you for leaving everything so clean...it is always greatly appreciated!! Loved our stay in the Bonefish unit of the BBH. It was very clean, had everything we could have needed and more, the location was perfect, and it was peaceful and quiet. Literally just steps from the beach out in front and centrally located on the island. The yard/surrounding grounds were beautiful and well maintained. The maps/book were very helpful. Skip and Sharon were the perfect hosts-friendly and available for questions but not intrusive. Do not hesitate to stay here-I hated to have to leave. Thanks Skip and Sharon. It was a pleasure having you both as guests and we certainly hope to see you again in the future!! Skip & Sharon were fantastic hosts, & the property was in immaculate condition. Perfectly situated in the center of the island, making north or south travel easier. They provided us with a nice welcome packet in our car upon arrival with maps, etc (they also arranged the car for us). Also discovered a binder at the house with very detailed information on beaches, shopping, dining, etc (they definitely attend to every last detail). Counting the days until we can stay at the Barefoot Beach House once again! We enjoyed having you both as guests...after you were finally able to get here!! We always appreciate guests that have the same values as we do. Looking forward to your next visit!!! We stayed for 3 nights, but wished we were able to stay longer. The Bonefish Bungalow was everything we could hope for in a vacation rental unit. Sharon and Skip had the placed stocked with everything we could possibly need (towels, utensils, tuperware, cooler, toiletries, appliances, spot light for looking at night time beach critters, etc.). The place was spotless and on such a beautiful peace of property. One of the highlights was taking the sea kayaks out to the nearby cays to explore and snorkel. Would definitely recommend this vacation rental and the Island of Eleuthera. It was a pleasure having you as guests. 3 nights is such a short time on our beautiful island but hopefully you will be back for a longer visit. We offer our returning guests a 10% discount. Thank you for choosing us for your vacation and hope to see you again! Beautiful clean property ! Sharon and Skip were wonderful hosts. It was so great meeting you and we enjoyed having you as a guest. I am looking forward to your return visit...maybe some yoga classes...smile!! 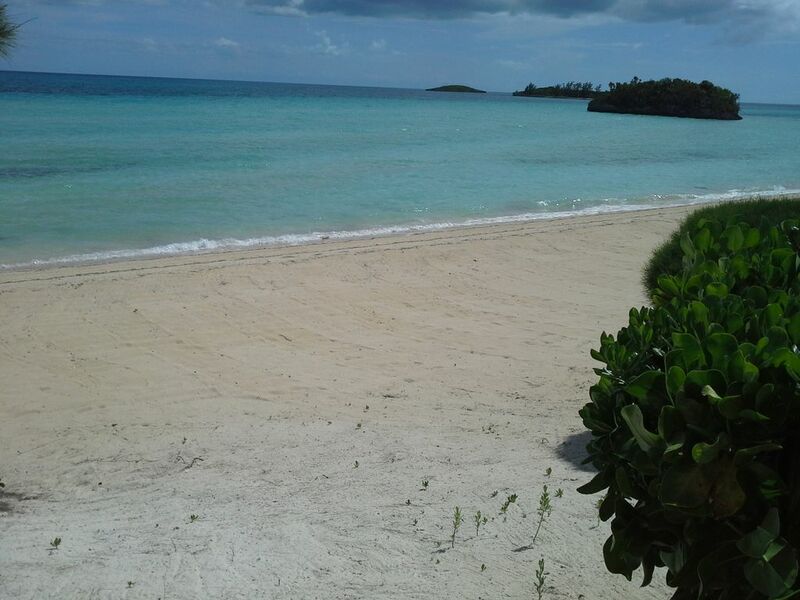 We are located on a sandy beach about midway on the island so perfect for day trips to the north or south. Several small stores and retardants within a 5-7 mile drive. Explore beaches, snorkel the crystal clear waters, explore with the kayaks, soak up the sun, watch the stars at night that are like diamonds, just relax and leave your worries behind you! !